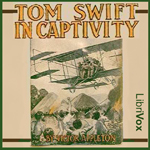 Tom Swift is approached by Mr. Preston, the owner of a circus, and begins to tell the story of Jake Poddington, Mr. Preston’s most skilled hunter. As it turns out, Jake went missing just after sending word to Preston that Jake was on the trail of a tribe of giants, somewhere in South Africa. That was the last Preston has heard of Jake Poddington. Preston would like Tom to use one of his airships to search for Poddington, and if possible, bring back a giant for the circus. Listeners are forewarned that some elements and characters included in Tom Swift books portray certain ethnic groups in a very dated manner that modern readers, and listeners, may find offensive. Despite the racially stereotyped behavior and pronunciation in the books, the Reader believes it makes sense to read what’s written in order to be faithful to the author’s intent.